We’re still waiting to see more of Final Fantasy VII Remake ever since Square Enix said that they’ve revamped some of the designs, but we got a glimpse at a new screenshot from the job recruitment page for Business Division 1. 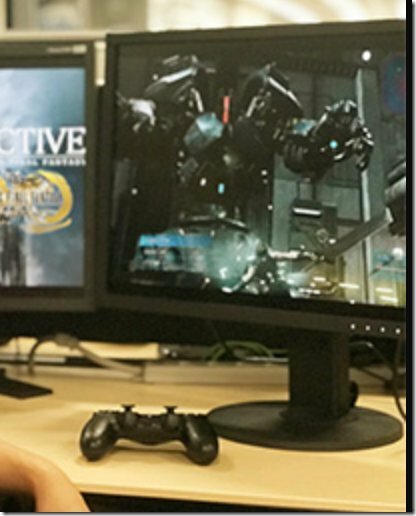 The above image featuring development leader Naoki Hamaguchi shows a new image of Final Fantasy VII Remake, and what appears to be the Air Buster boss you fight early in the game. 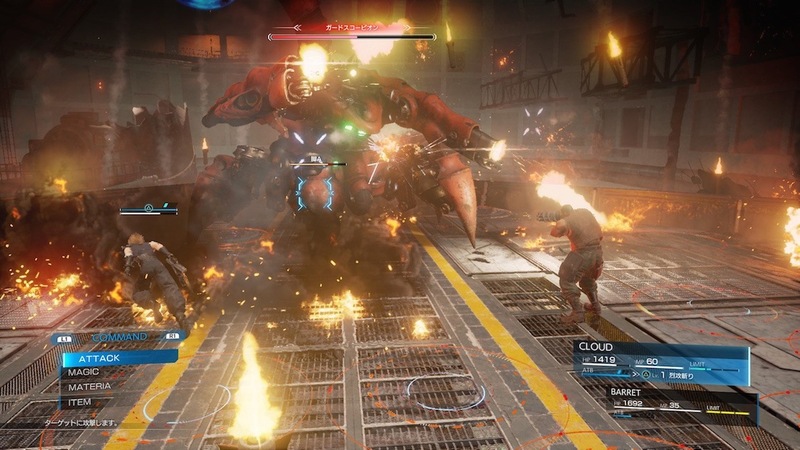 Final Fantasy VII Remake director Tetsuya Nomura shared in an interview in this week’s issue of Dengeki PlayStation that the upcoming game’s battle system won’t be command-based, but an action-based one. 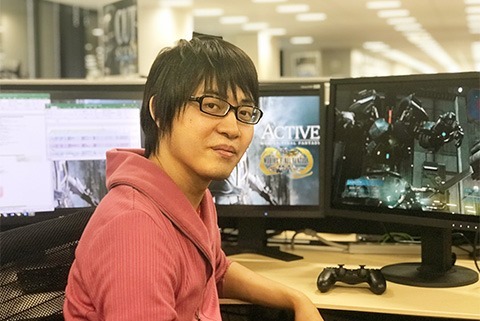 According to Nomura, a previous on-site interview didn’t interpret the information the way he would’ve liked, so he wanted to take this occasion to clear something up. That’s about the battle system, which won’t be a command-based one, but an action-based one. The above is a look at a gameplay screenshot that was revealed at MAGIC 2017 last month. It shows Cloud taking cover from fire, but Nomura says while there may be some maps that allows you to take such actions, it won’t be a necessity. This screenshot was mostly to show that it is seamless and there are various actions you’ll get to take according to the areas. Again, the Guard Scorpion’s map will have parts that are destructible, and the battle will be a flashy one that consists of numerous attacks that weren’t in the original version. 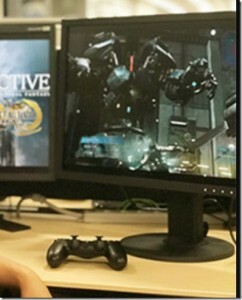 Nomura says that if you look closely, you can even see a bunch of missiles being launched in the Guard Scorpion fight. As some of you may have noticed, the party menu certainly does indicate “ATB” under the health bars, so it’s safe to assume that it’ll be something quite different from the original version in Final Fantasy VII Remake. Famitsu: Previously, Hashimoto-san (Shinji Hashimoto) was able to make the trip, but this time Nomura-san, you made your first appearance. This would be your first time going to Monaco, correct? Nomura: Yes. Due to my busy schedule, I don’t get much free time, and I didn’t get to go site seeing that much, but it’s certainly a beautiful country. Famitsu: Other than Nomura-san there were many luxurious guests. Were you able to make any interactions? Nomura: I’m a fan of Mike Mignola’s Hellboy, so it made me happy to be able to stand on the same stage as him. I was able to meet him a few days before MAGIC. Actually, a few years ago I got his autograph on colored paper through an acquaintance, and he wrote “I hope we get to work together someday.” And this time we accompanied each other in such a way, so it meant a lot to me. Famitsu: It looked like you got plenty of coverage from the foreign media. Nomura: It seemed like a lot of people were asking about the Japanese games industry. We talked about how it seems that lately there isn’t enough personnel in Japan to develop HD titles and how we can sense that foreign titles are starting to take the edge because of that. Famitsu: I see. So the local fans were very passionate. Nomura-san, you had a standing ovation during the talk event, and your autograph session had a long line. Nomura: Since I don’t get to visit Europe that often, it feels like all the fans brought in their passion. This time we didn’t have an interpreter who specializes [in video games] so there’s a chance that there were some mistranslations, and even though I didn’t get to talk to the fans that much, there were many that brought all kinds of rare goods to the autograph session, so that made me happy. Famitsu: Cloud’s designs were created through five stages, and the talk show had some inside story about how there was a mythical sixth stage to it among other talk during the talk event. Nomura: Since it was a special occasion, I decided to talk about all kinds of things. 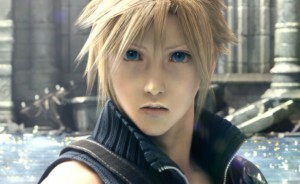 Cloud’s mythical sixth stage was more on the realistic side, and his sword had more details that made it closer to a Western-style sword. His head and body was a little taller, and his physique was detailed with more muscles, so he was pretty buff [laughs]. Since I was short on time, I had to put together all the content from the talk show at midnight on the night before, and it went from not having any solid content to talk about to getting help with only images from the marketing team who helped working on the slide… preparations weren’t done until the morning, so it was quite the trouble [laughs]. Famitsu: For what it’s worth, it looked like everyone had a good time. Not only did you talk plenty about character designs, but you were able to present new screenshots. Nomura: Perhaps it’s because I’m known for not talking much, but it was quite a surprise. I really wanted to make everyone happy, and I was able to talk about things that I wasn’t able to before, such as the making of the trailer. Famitsu: I believe that you were asked by fans about Nomura-san’s secrets of making a trailer. Nomura: When I work on trailers, I look at it from numerous patterns of feelings. The feelings of those who watch it for the first time, the feeling of the core fans, the feeling of those who are indifferent, with such state of feelings in mind, I watch them over and over. I especially watch it with the feeling of people who are watching it for the very first time. I believe that trailers and games are both parts of the product, so the way I think for them are just about the same. 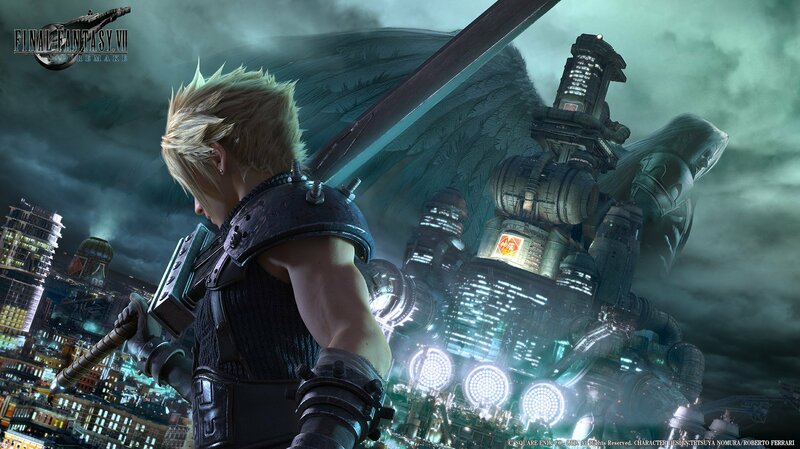 Famitsu: Let’s talk a bit about Final Fantasy VII Remake. 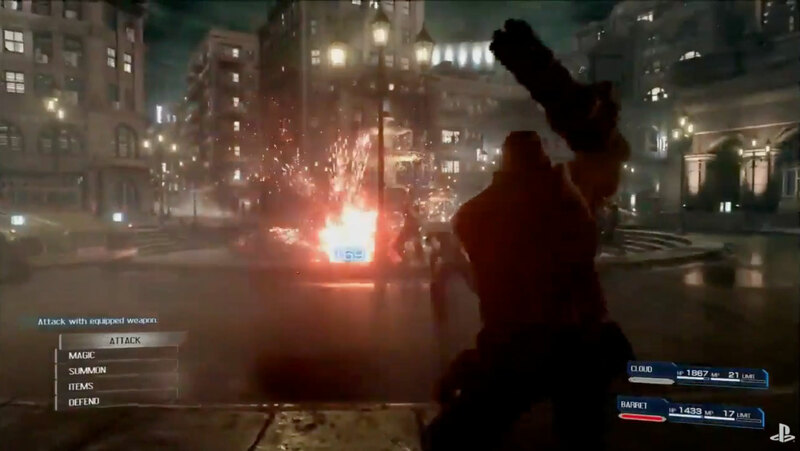 In the screenshot (above) we see Cloud using cover action. Nomura: In the story, there are situations where you’ll be infiltrating, and you won’t always get to simply walk down the middle of a path. The original version had random encounters so we were able to leave that up to your imagination, but since this time it’s seamless the infiltrating progress will certainly catch some eyes, so it was decided that we needed to show some reality there. You’ll get to take cover in shaded areas until soldiers walk by, or blow up enemies using grenades, those are the kind of uses there will be. And of course, you can just dive in and take them on in battle instead. 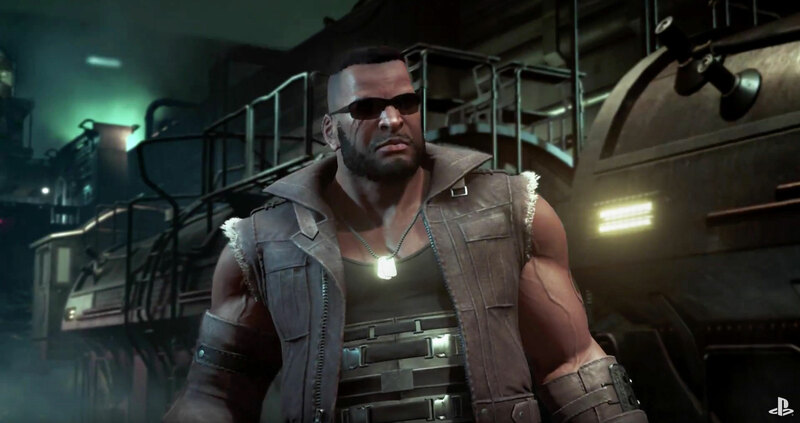 Famitsu: Will Barret also get to use cover action? Nomura: Yes he can. While I can’t say much in detail about this now, gunners will have elements that are characteristic to gunners. Famitsu: Is that so? We felt some impact from the battle scene where we can see Barret fighting alongside Cloud against the Guard Scorpion. Nomura: Rather than just settling with a scaffold, the battle will take advantage of its space and the map’s characteristics, where you’ll get to switch between Cloud and Barret in the fight. For example, when there are enemies that are in places that can’t be reached by Cloud’s sword, it’ll be more effective to switch to Barret, so there’s a bit of strategy at play there. The Guard Scorpion also changes its mode during battle, and it’ll also show some behavior that wasn’t in the original version. You might have gotten an idea for that by seeing missiles falling down in the screenshot. It’s shaping up to be a very flashy battle. Famitsu: That’s right. It looks like now that the battle is changing to action, we’ll get to experience a whole new way of playing that is different from the original version. Nomura: Maps and objects will be destructible, and there will be other destructible elements, for example, you’ll get to break some parts off like the Guard Scorpion’s legs. Nomura: We’ll have to talk about the ATB and skill on another occasion. As for Materia, we can say that it’s something like a skill. It’s different from magic, and you can use it when a Materia that has effects that are usable in battle are set. Famitsu: We can’t wait to hear more information from updates on Kingdom Hearts III and Final Fantasy VII Remake. Nomura: This time we’ve prepared new materials to present at MAGIC. Since both titles have promotional plans being planned out, there’s only so much I can say about them now, but we’re enhancing the systems and progress is going smoothly, so please wait a little longer. 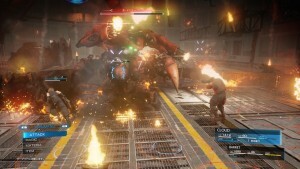 At MAGIC 2017 in Monaco, France, Square Enix showcased a couple new screenshots for Final Fantasy VII Remake, with a world premiere look at an in-game screenshot as well as a look at the first boss fight. The top image shows Cloud sneaking around the starting area as well as a brief look at its UI, which Tetsuya Nomura mentioned isn’t final, but what they have for the time being. If you look very closely, there’s an ATB bar located right underneath the HP parameters. Nomura also noted that they’re putting a lot of attention into the battle system, so things can happen with little interruption. They’ve discussed problems they’ve had with grenades during meetings and asked themselves whether allies would also take damage as well from the grenades. 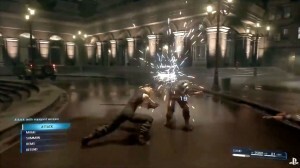 The next screenshot is of the Guard Scorpion, the first boss you encounter in Final Fantasy VII with Cloud and Barret. 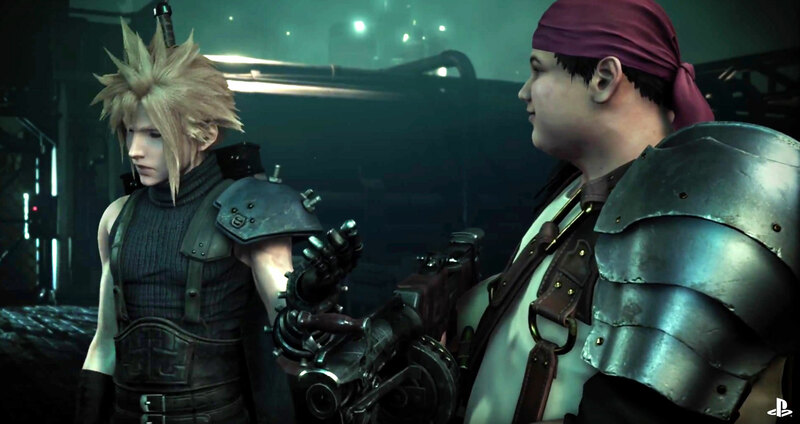 In Final Fantasy VII Remake, some of the areas around it will be destructable. Nomura said that he wanted to show a video but the office disallowed it. Square Enix is hosting their special Final Fantasy 30th anniversary event today, where they showed off a new key visual for Final Fantasy VII Remake featuring Cloud and Sephiroth. Producer Yoshinori Kitase talked about the latest of the upcoming PS4 title in an interview with Famitsu magazine. Famitsu: What’s the progress condition for Final Fantasy VII Remake looking like? Yoshinori Kitase, Producer: We’re currently brushing up the scene from the announcement trailer. We can now see the line of quality that we’re aiming for more clearly, but there’s still a ways to go. Should the production be prolonged due to being in multiple titles, will the rest of the titles maintain the quality from the first? Kitase: With the quality line set in place, it’s our duty to carry on and protect it until the very end without having any disturbances for the episodes under production. But of course as we advance through the episodes, it’ll only be natural to have quality that is fitting for the next generation [of when the episode releases]. Will there be anything to fill the gap while waiting for the next episode announcement? 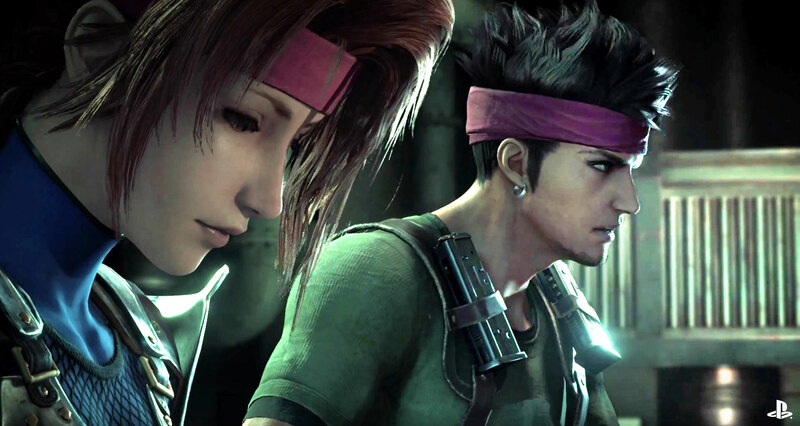 Kitase: Final Fantasy VII expanded through a compilation. We don’t have any fundamental plans on that for now, but since the game volumes won’t be something that we can release in just a few months, we’d like to think of a way to supplement those gaps to maintain interest. Such as releasing videos using models from Final Fantasy VII Remake? Kitase: There’s plenty that we’d like to do. Will there be DLC and smartphone developments as we saw in Final Fantasy XV? Kitase: I’d like to use that as a reference. A live stream or a program to keep in touch with the users is something I’d like to do, but Final Fantasy VII Remake will be episodic, and if we want to have it go all the way to the end of the original version, then I believe we’ll need to devote everything we got for it, so I have no idea what will happen for things such as filler development [between episodes] and other works. Kitase: There’s still a lot that I can’t say but we won’t be removing any parts of the original Final Fantasy VII that was well-received. Kitase: That’s what we’re hoping for, but it’s still undecided. However, as for when we’ll release the next information, for example, I think that it’d be nice if we could have it playable or a trailer for it at an event. Please remake Final Fantasy VI! “The hardware itself has evolved since the release of Final Fantasy VII, and the games are more real, and real-time based. 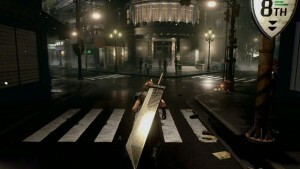 The previous Final Fantasy VII was a command-based RPG that utilized active-time-battle. Real-time and GMC are the trends these days. I can’t say the new game is completely action-based, but it has more of that element and real-time than the previous game. This sounds very promising for the remake. However, we also received not so promising news of the remake. 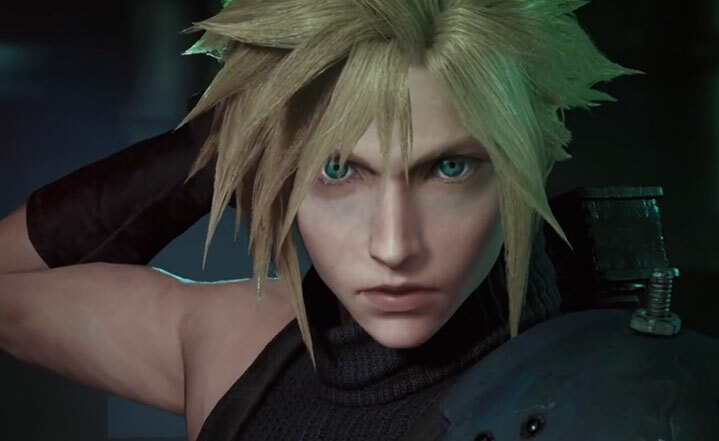 “Final Fantasy VII Remake will be told across a multi-part series, with each entry providing its own unique experience.” We need clarification on this from Square Enix, since it’s a bit vague, but that doesn’t leave much room for interpretation. If this is indeed a multi-part series, this could possibly be devastating to Square Enix. If they mess up on the first game, will fans receive an incomplete saga? The newest Final Fantasy VII trailer was unveiled at the 2015 PlayStation Experience today. This trailer was designed to show off Cloud Strife and reintroduce him to audiences, but it did more than that. It showed some more dynamic environments he’ll have to run through. 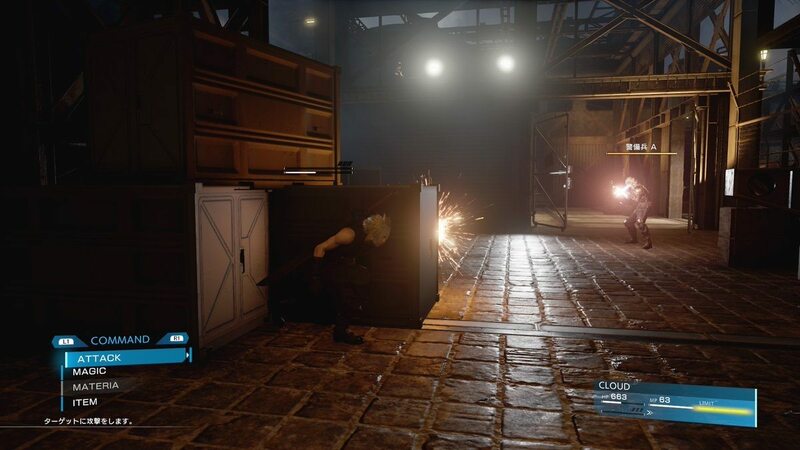 He has to crawl through small spaces in the demo and duck his way through crumbling areas. The Final Fantasy VII trailer also highlighted some of the new English voice acting and a brief look at the battle system. Square Enix hinted at “dramatic changes” to the battle system earlier this year, and from speculation it is quite possible it is still a turn based system with a menu bar on the lower left screen. 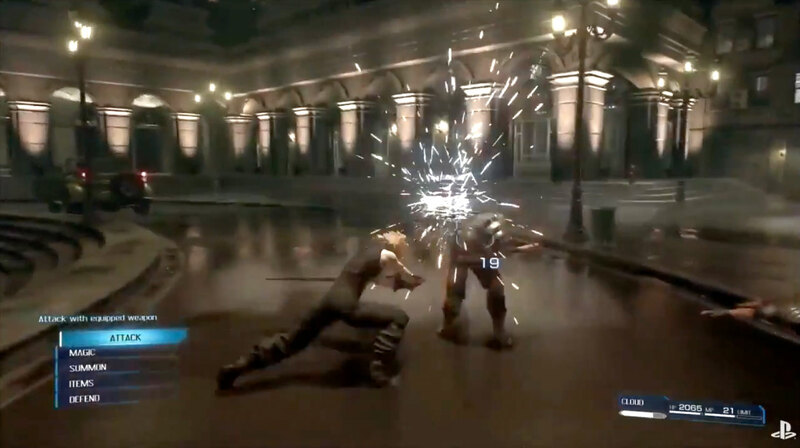 The basic options of ‘Attack’, ‘Magic’, ‘Summon’, and ‘Items’ are familiar with a new selection for ‘Defend.’ As you can see Cloud dashes to his targets on the screen, along with Barret freely walking around while shooting his opponents. Both Cloud and Barrett speak for the first time in the video, as well as Biggs, Jessie and Wedge. The original script seems to be intact. So far fans are very pleased with the newest trailer for the remake. Yoshinori Kitase appeared onstage at the PlayStation Experience and stated that the new footage shown only represented a small portion of what will be added to the Final Fantasy VII remake.